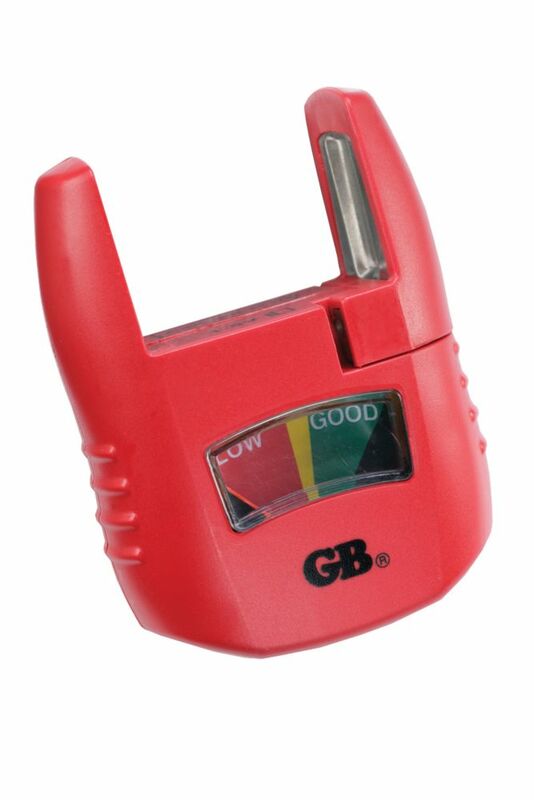 The Gardner Bender Battery Tester quickly identifies battery charge level on an easy to read analog scale with a simple low/good indicator. The movable contact arm fits multiple battery sizes including D, C, AA, AAA, N, 9 V rectangular, and a small rivette in the arm tests button cells. Small enough to fit in a pocket, keep it in your tool box or junk drawer for quick retrieval when needed. Includes a one-year warranty. The EX310 is a compact manual ranging multi meter that features an extra-large 2000 count display and built-in non-contact AC voltage detector (NCV). Includes battery test function (1.5 Volt and 9 Volt), diode test and continuity. Rubber holster protects meter. Meter is UL listed and has a Cat III 600 Volt safety rating. Includes test leads, 9 Volt battery and tilt stand. The AN100 is a CFM/CMM Thermo-Anemometer that can simultaneously display air flow or air velocity plus ambient temperature. Easy to set area dimensions (cm2) are stored in the meters internal memory for the next power on. Additional features include: 20 point average for air flow and 3% velocity accuracy via low friction 2.83 in. D (72mm) ball bearing vane wheel on 3.9ft (120cm) cable. Comes complete with 9V battery, protective rubber holster and case. The MO260 Combination Pin/Pinless Moisture Meter measures Relative Moisture in wood and other building materials using pinless technology and percent of Moisture in sheet rock and other materials using the direct pin method. Measurements are displayed on a digital LCD with backlighting and a tri-colour LED barograph. Pinless non-invasive measurement depth to 0.75 in. (22mm) below the surface. Complete with 9V battery, replacement pins, protective cap, and pouch case. Battery Tester, Analog Low/Good Indicator, Test AA, AAA, C, D, 9 V, 1.5 volt button cells, 1/Ea The Gardner Bender Battery Tester quickly identifies battery charge level on an easy to read analog scale with a simple low/good indicator. The movable contact arm fits multiple battery sizes including D, C, AA, AAA, N, 9 V rectangular, and a small rivette in the arm tests button cells. Small enough to fit in a pocket, keep it in your tool box or junk drawer for quick retrieval when needed. Includes a one-year warranty. Battery Tester, Analog Low/Good Indicator, Test AA, AAA, C, D, 9 V, 1.5 volt button cells, 1/Ea is rated 4.3 out of 5 by 96. Rated 5 out of 5 by Rae from Small, easy to use - works great. No more wondering how much life is left in the battery. Like ... Small, easy to use - works great. No more wondering how much life is left in the battery. Like the small size - easy to store and use. Rated 5 out of 5 by Bigbuck from I had one for years, finally died last fall, was months finding where to buy it. I had one for years, finally died last fall, was months finding where to buy it. Rated 4 out of 5 by grove from this is good for many batteries including 9 volt and 1.5v button batteries. It does have one limi... this is good for many batteries including 9 volt and 1.5v button batteries. It does have one limitation though, it is not good for 3v button batteries. So if you have AA AAA C D 9V or button battery that's 1.5 this will work for you. Rated 5 out of 5 by HomeDepotCustomer from Easy to use. It indicates the strong or weakness of the battery in the background of red,yellow, ... Easy to use. It indicates the strong or weakness of the battery in the background of red,yellow, and green chart. If the pointer is in the low green area, it does not mean the battery is good; the voltage may be still weak for operating certain device. If the pointer is in the high green area, it means the battery is good for sure. We know how good the battery is by looking the pointer. Rated 5 out of 5 by Leslie from It is very easy to use.... It is very easy to use.